I had a few hours to spare today, so I visited BLDG 92 at the Brooklyn Navy Yard. I had a great time — the exhibit is awesome, and I met some cool people. I had planned to write a post on the HMS Jersey and the other prisoner-ships that were moored in Wallabout Bay during the Revolutionary War, but that will have to wait. I got sidetracked by a project that has held my curiosity for a while. All things considered, New York has a great subway system: it’s extensive, it runs 24 hours, and it has local and express trains on many lines. But there’s only one stop (that I’m aware of, anyway) that has local, express, and super-express trains. That stop is DeKalb Avenue on the BMT. 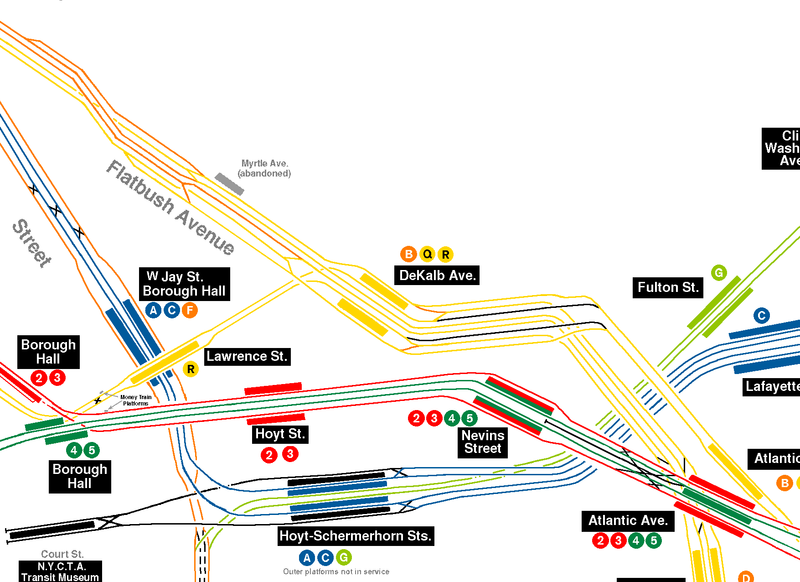 Detail from the map of the MTA New York City Subway, with DeKalb Av highlighted. Note how the D and N trains skip the stop. © Copyright 2012 Metropolitan Transportation Authority. The station has six tracks, four of which are accessible from platforms. During the day on weekdays, the B and Q share the outside tracks; the R has the inside tracks to itself; and the D and N share the super-express tracks, which run inside the R in a walled-off area, although you can see into this area from the platform. Heading northbound from DeKalb Avenue, the R hits some local stops in Brooklyn before reaching Manhattan at Whitehall St, while the other four lines cross the Manhattan Bridge. I ride the B and the Q regularly, but it was only recently I noticed that by the time you reach daylight on the bridge going toward Manhattan, all B and D trains — in both directions — are on the north side of the bridge, while all N and Q trains are on the south side. So they must do a massive switcheroo somewhere underground. But how? There’s no way the tracks cross, because that would be too dangerous. Naturally, this became an obsession of sorts. I drew this diagram as a starting-point to my investigation. What goes on inside this black box? I had one clue as to where the cross-over might happen, and I’ll sum it up in one word: zoetrope. If you’re on the B or the Q heading toward Manhattan, 20-30 seconds after leaving the station, you’ll see what appears to be a movie playing on the right side of the train. It’s actually a succession of 228 hand-painted frames, installed in 1980 by filmmaker Bill Brand, called Masstransiscope. It’s not too much farther until you hit daylight, so the northbound B and the Q must split somewhere in that space. As it turns out, Masstransiscope is on the platform of the abandoned Myrtle Av station, which last saw service in 1956. (The southbound platform no longer exists.) The station was closed to allow for an expansion of the DeKalb Av stop and the installation of “flying junctions”. Flying junctions ensure tracks never cross, allowing multiple trains to use the same area simultaneously without risk of collision. I’m a weird dude, so I decided to take it off the two-dimensional page and into the three-dimensional world. And what better day than a rainy one for a little arts-and-crafts action? Enter: Play-Doh! Or, in this case, ALEX Super Soft Glitter Dough, because it was cheaper. Unfortunately, it did not come in orange. I figured I could get two lines out of each pack, splitting each in half and rolling them into a long tube. Turns out doing this is like riding a bicycle: you don’t forget it from when you were five. Yep, that’s a yoga mat. So now I know. I’ll sleep well tonight. This entry was posted in Bonus posts and tagged arts and crafts, B train, Brooklyn, D train, DeKalb Av, flying junction, Manhattan Bridge, maybe I need a new hobby, MTA, N train, New York City subways, play-doh, Q train, R train, zoetrope. Bookmark the permalink. I’m glad that you will sleep well. I’ll be up all night. Keith, you are my new favorite. This is amazing. Actually in all seriousness, every day I transfer from the R to the D or N at Atlantic (I take whichever train comes first), and have always noticed the trains slow down a bit shortly before the bridge. Always wondered why… this must be it. i saw the masstransiscope movie today, and came across this. this is great! This is fantastic. Thanks for doing this detective work and figuring this out. What a marvel aspects of our subway system are.